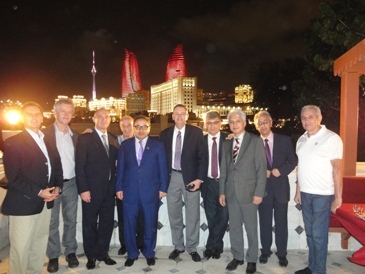 On 08th of October 2012 the University of Belgrade and the Baku State University signed a Memorandum of cooperation. The Memorandum was signed by the rector of the University of Belgrade Mr.Vladimir Bumbasirević and the rector of the Baku State University Mr.Abel Maharramov. The Memorandum envisages the exchange of students, researchers and doctoral candidates, the organization of joint symposiums, seminars and conferences. Speaking prior to the signing ceremony, Mr.Maharramov highlighted BSU`s activity and foreign relations. Stressing the importance of education in a globalizing world, Mr.Maharramov touched upon the necessity of inter-university relations. Bumbasirevic spoke of the University of Belgrade`s history and activity. They also discussed prospects for cooperation between the two higher educational institutions. The Ambassador of the Republic of Serbia Mr.Zoran Vajovic also participated at the meeting.